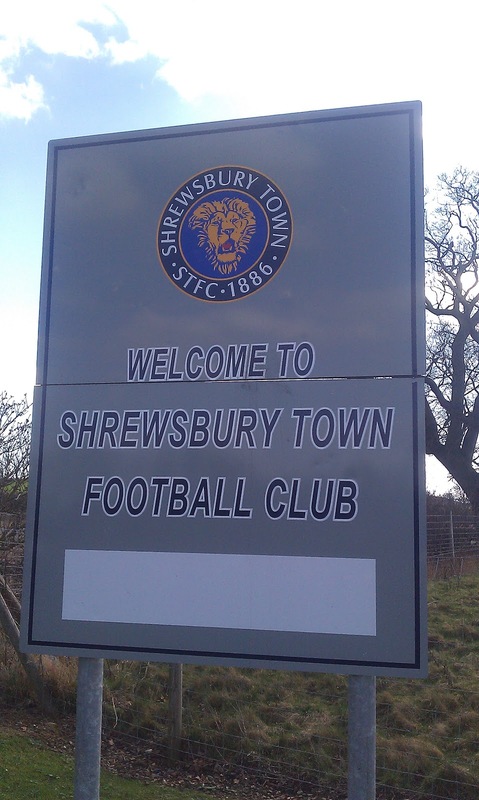 2: In 1950, Shrewsbury Town joined the Football League and bar the season of 2002-03 when they were relegated to the Conference, they've remained there ever since. Finishes have ranged from a high of two finishes of 8th in the second tier, achieved in the 1984 and 1985 to a low of bottom of the 4th tier in 2003. The latter saw relegation to non-league, but they bounced back immediately through the playoffs, beating Barnet and Aldershot Town in the playoffs. 4: Shrewsbury Town's best ever progress in the League Cup came in the debut season of the competition. In 1961, they reached the semi-final before losing 4-3 on aggregate to Rotherham United. 5: Up until 1985, Shrewsbury Town often played in the Welsh Cup, winning it six times and finishing as runners-up on three occasions. The last of these wins came in 1985 as they hammered Bangor City 6-1 on aggregate. 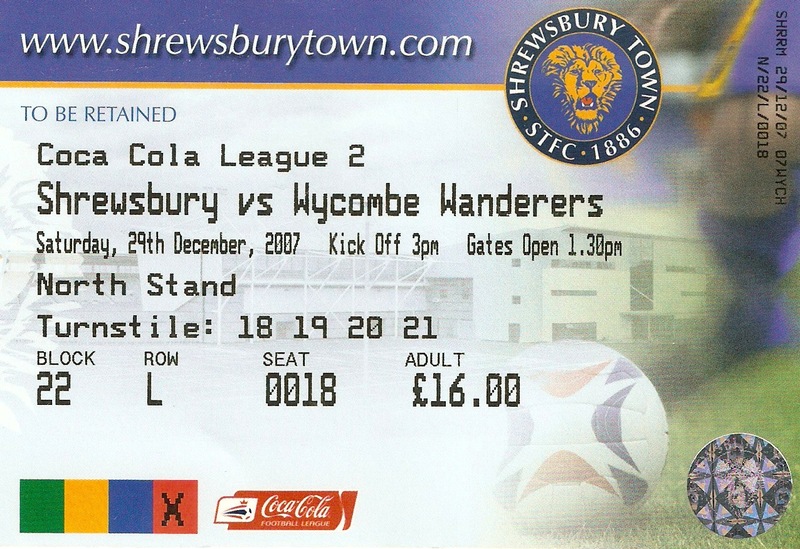 6: The Shrews reached the Football League Tophy Final in 1996, losing 2-1 to Rotherham United at Wembley Stadium. 7: Record attendances include a crowd of 18,917 at Gay Meadow for a 3rd Division game against Walsall in 1961 and at the New Meadow an attendance of 10,210 for a FA Cup 4th Round game against Chelsea in 2014. 8: The record victory of 21-0 game in an 1894 Welsh Cup game against Mold Alyn Stars. Eleven years later, they suffered their record defeat, losing 13-0 to Small Heath (now called Birmingham City) in a Birmingham League game. 9: Famous players to play for the club include Joe Hart who earned himself a move to Manchester City. 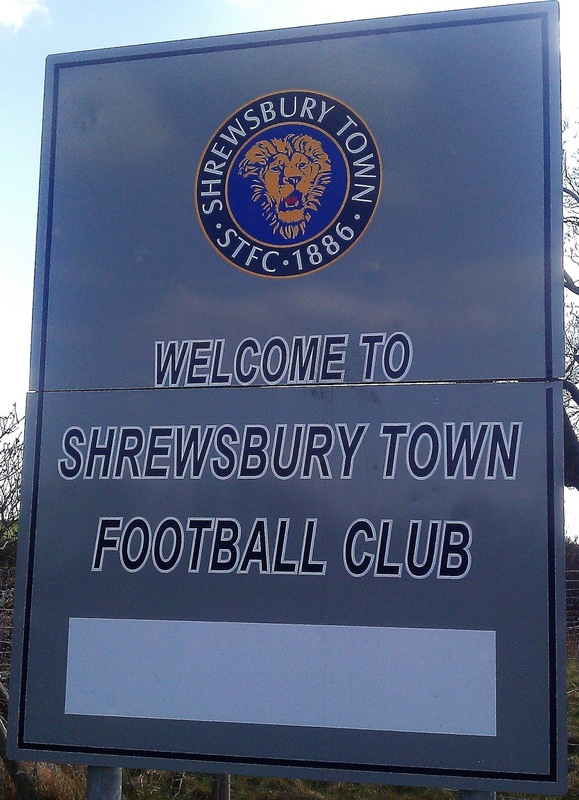 Other well-known names to play for the Shrews include Neville Southall and John McGinlay. 10: The town of Shrewsbury itself has a population of just under 72,000 and famous Salopians include Charles Darwin, Michael Heseltine and Michael Palin. On my first visit, Wycombe gained their 4th victory in a row with an excellent 1-0 win at fellow promotion rivals Shrewsbury Town. It seems unbelievable that 3 weeks previous they were losing 6-0 at Stockport and not playing at all well. But how things can change. It was an excellent performance, we battled well to gain a deserved victory. The future looked rosy, 3 weeks previously, you wouldn't have bet any money on Wycombe getting promoted. There was a biting Shropshire wind in the air, but Wycombe's excellent performance warmed up the 500 or so travelling support. The goal came in a first half which Wycombe dominated. John Sutton followed up Scott McGleish's shot that had been parried by Shrews keeper Glyn Garner. There were several other good chances for Wycombe, with a few for Shrewsbury too, but Wycombe were good value for their lead going in 1-0 to the good at half time. The second half was a different story though, Shrewsbury came out like a wounded animal and hit the woodwork twice in 5 minutes. It was mainly Shrewsbury for the rest of the game too, with Frank Fielding and the Wycombe defence performing miracles to keep them at bay. Youngster George Daly came on with 20 minutes to go and did really well, he looks a real prospect for the future and it's great news that he is getting his chance to prove himself. Subsequent visits saw Wycombe remain unbeaten, or at least they were when I went. In December 2008, it was another 1-0 victory, this time the goalscorer was Matt Harold. It took Wycombe 9 points clear at the top of League Two, an impressive feat against 3rd placed Shrewsbury who had defeated Wycombe 7-0 at Adams Park a couple of months earlier in the Football League Trophy. For my final visit in March 2011, the game will be remembered for the crazy incident which led to Wycombe's equaliser. We'd played quite well, but were behind thanks to James Collins' goal on the half hour. Then, five minutes after half time a shot by Gareth Ainsworth was saved by Shrewsbury keeper Ben Smith. The shot was nowhere near in, a clear few yards from crossing the line but the linesman awarded a goal and referee James Linington signalled a goal. An incensed Shrewsbury took the game to Wycombe and were unlucky not to win, but we held on for the point thanks to a decision that was so bad, it was embarrassing. The New Meadow was on my list of grounds to revisit so that I could update my blog, so I'd decided on this visit as far back as last summer. I'd managed to visit the majority of my targets this season, but various reasons, either financial or Wycombe putting in a stinking performance in the previous match. That was the case for this game too, we put in a fantastic performance against Sunderland on Saturday, only being denied a win thanks to a last minute error from keeper Ryan Allsopp. We’ve got an awful home record against Accrington who we played on Tuesday but were 1-0 up and looking fairly comfortable just before half time. Then, thanks to yet another Allsopp blunder, we conceded another needless penalty and went into the break level. The second half was a terrible performance and we ended up losing 3-1. I might have opted out of Shrewsbury there and then but two things stopped me. Firstly, I’d already got my ticket and second, the Independent Supporters coach had chosen a good pub to stop at. The White Hart in Shifnal passed me by when I visited Shifnal Town FC earlier this season as my time in the town was limited. But they appeared to do real cider and good food. There were also a couple of backups in The Plough and The Anvil who I emailed but both failed to reply and would, therefore, be unlikely to get my custom. I had a late night on Friday and only got around 5 hours of sleep, waking at 6.30. I woke up and lazed around for a couple of hours before leaving the house at 8.40. After going down the local shop, I met my Dad at the coach pick up point at 9 and soon we were on our way. I was happy to get a double seat to myself and pay the reasonable fare of £20. We did pre-orders for food with me opting for faggots, chips and peas. 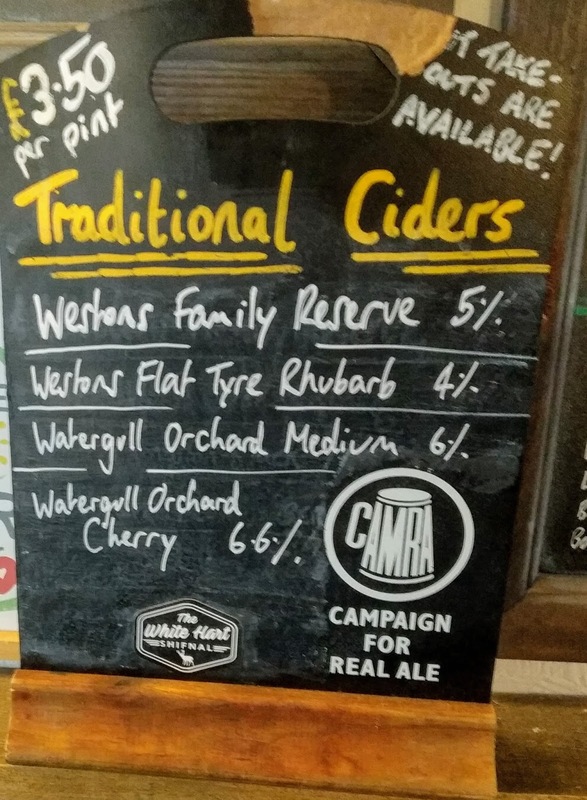 We got to the pub just before 12 and I had pints of Watergull Orchards Medium and a Cherry one. After that, I went to The Plough and had a pint of Sandford Orchards Hogfather. A brutal but nice cider at 7.4% and so I finished off with a half of Watergull Medium which was the best of the day. 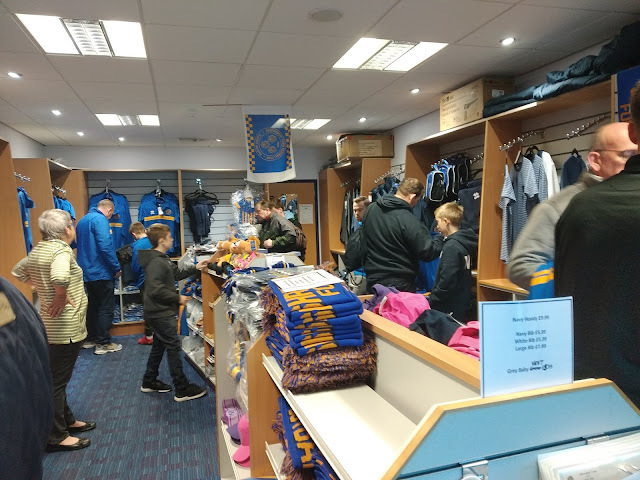 So we left and got to the ground at 2.30 and so I stopped at the club shop to get a pen. The game. It was a dreadful first half and a dull second but Wycombe eventually grabbed the lead 23 minutes from time. It was a great free kick from McCarthy and for a long time, we looked comfortable. But Wycombe proceeded to throw it away in the last 5 minutes and injury time. Firstly lousy marking from a free kick allowed Omar Beccles to slot home. A draw was a huge disappointment but at least it would have stopped the rot. But the someone gave away a stupid penalty, Ollie Norburn converting the spot-kick to ensure another miserable afternoon. I was fuming with the team and it made for a long journey home. I can’t think of many times when I’ve felt worse as a Wycombe fan, but amazingly the trip home made things seem less bleak. By the time I got dropped near my house just after 8, I was feeling a lot better. I stopped at the Co-Op to get a few bottles for Match Of The Day later. The rest of the evening was spent catching up on various things. Usually, the Sunday morning would be hell, but with a fortnight off coming up, I was in a positive mood. The NEW MEADOW (or Montgomery Waters Meadow as it is currently known as for sponsorship purchases) was opened in 2007, replacing the clubs much-loved, but ageing Gay Meadow. With 4 fairly identical seated stands and a capacity of just under 10,000, it provides good views and leg room but lacks the character of their old home. This season the club installed 550 'safe standing' places at the home end, the first club in English football to do so. Away fans get around 2000 sets behind one of the goals. Food in the ground is the usual basic range at inflated prices. 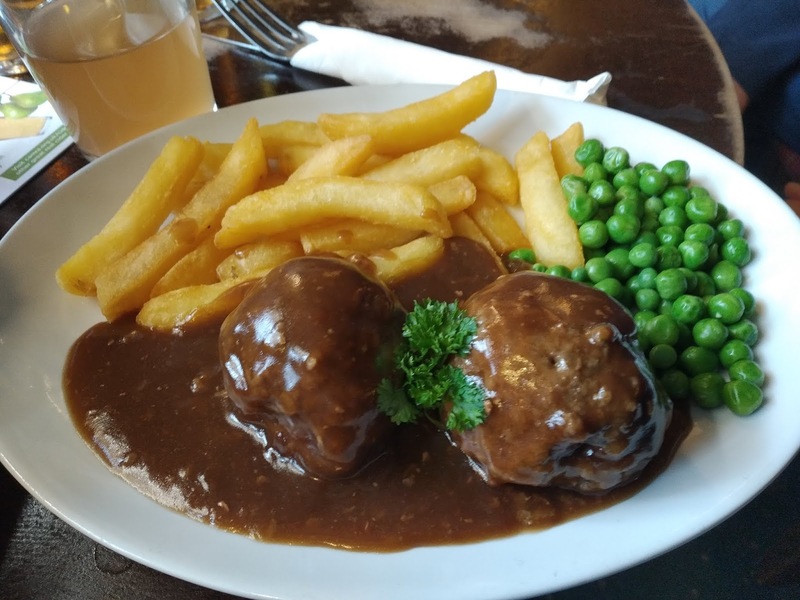 Nearby pubs include the Wild Pig which is a few minutes from the ground and charges £5 for parking or the Charles Darwin, 10 minutes walk away with free parking for customers. For a better range of pubs, the town centre is a good bet, two miles away and offering a bus service to the ground if you don't fancy the walk.